Life with the Sherpas revealed different ways of seeing the world. It peeled away my preconceived notions. I have come to see that while outside cultures divide us, inner cultures, the core of all religions and beliefs, can bring us together. Arriving at the ridge crest, each Sherpa companion murmured a prayer and placed a small stone from the path on the cairn with prayer flags. I followed suit, relieved that our trekking group had traveled this path safely. Further along, we paused and turned out backs as wind and dust blasted across the pastures. We hid our faces in our jackets. Seeing only the ground before me, a premonition — an impact on the back of my head and a sudden sense of nothingness. I reacted by taking two steps forward. In that instant a thick plank, blown off a nearby hut, hit the back of my ankle. Stunned, I realized that had I not moved, the plank would have struck my head. 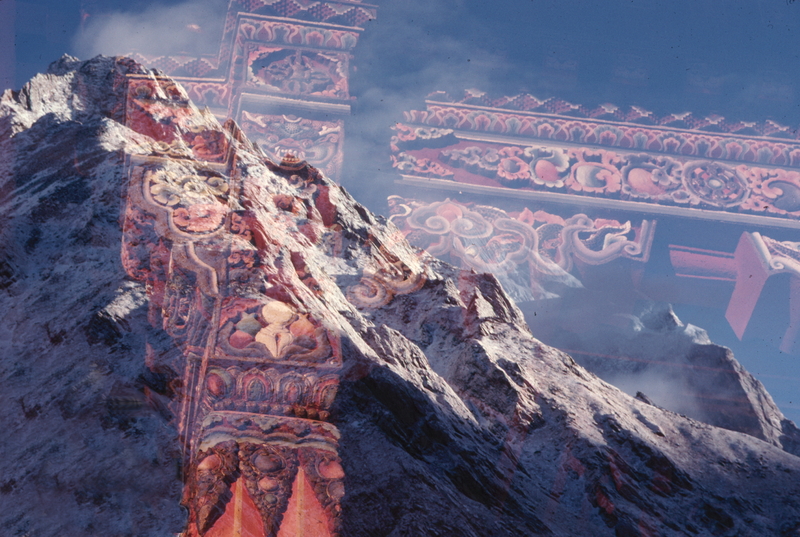 This event was my first real experience with the Sherpa perception of place, of the power of these mountains. 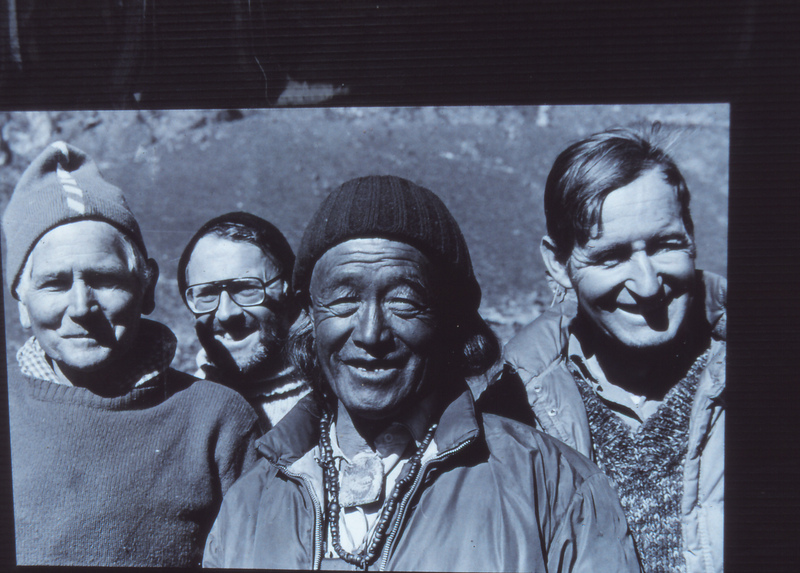 Mountain scenery first attracted me to the Himalaya, but the warm, friendly people became my enduring connection. 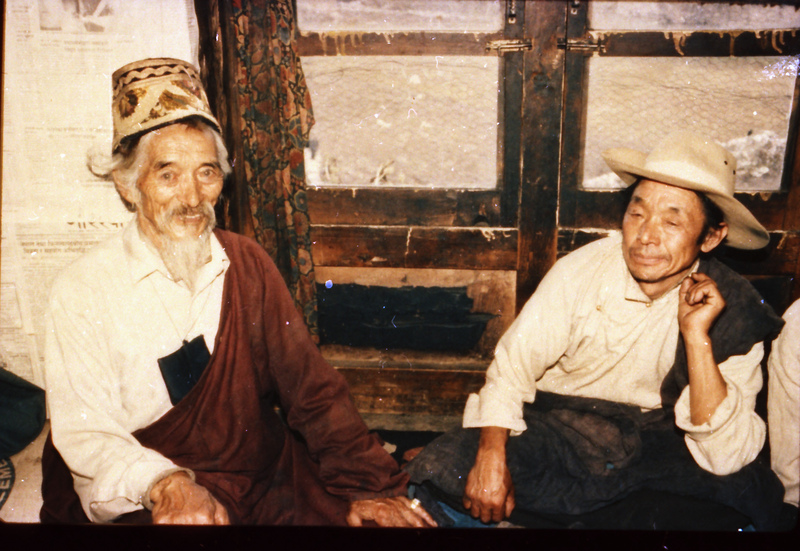 From 1983 to 1989, I had the opportunity and privilege to live and work with Sherpa people in the Khumbu Valley of east Nepal near Mount Everest, helping to create a museum of Sherpa culture at Tengboche monastery. The Sherpas are renowned through the literature of adventure, where they have earned an international reputation for their work on mountaineering expeditions, especially on Everest. 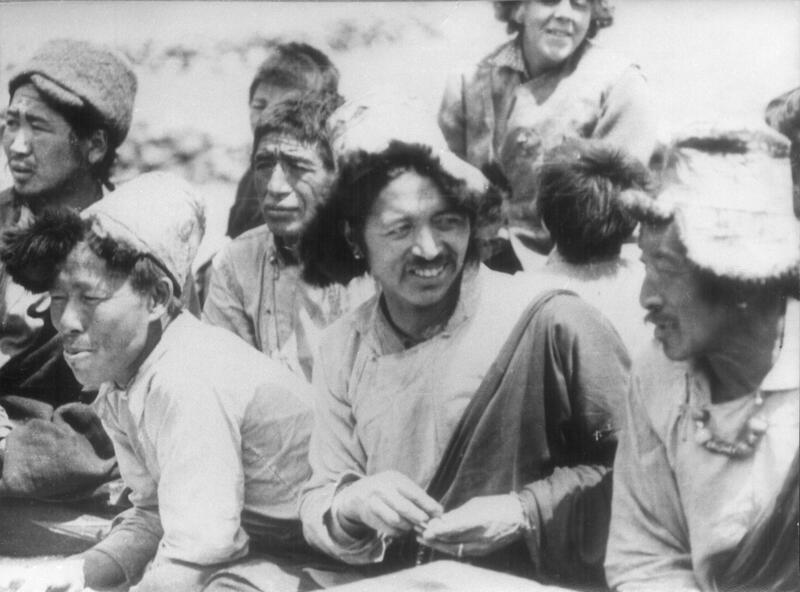 However, this reputation focuses on an occupation, rather than the Sherpas’ rich cultural heritage. 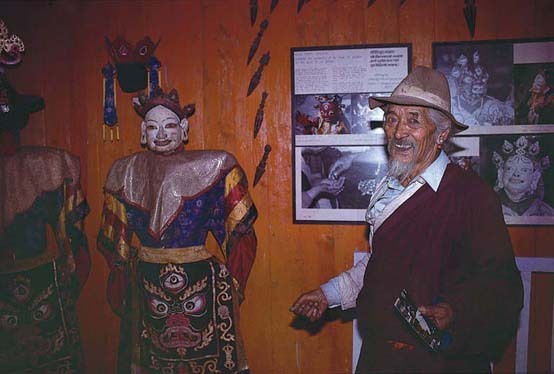 The museum described mostly what the Abbot of Tengboche calls the Sherpas’ “inner culture” and the importance of ceremonies that link their spiritual and physical lives. The preparation of the museum took time because it was essential to first know the people and the many dimensions of their culture in order to accurately and concisely depict it. While compiling information for the museum, I often found that conversations encompassed aspects of philosophy, psychology, and spirituality. Often the subjects we discussed wandered to the questions we seek to answer with religion or science: How did the earth begin? What happens after death? What is our relationship to nature? To our symbols in the environment? Conversations encompassed the metaphysical and the everyday. Over the years, my questions turned from the intellectual to the intuitive. I began to experience the culture rather than question it. Life with the Sherpas revealed different ways of seeing the world. It peeled away my preconceived notions so that I began to appreciate the significance of rituals, traditions, and symbols. In the process, I was changed. 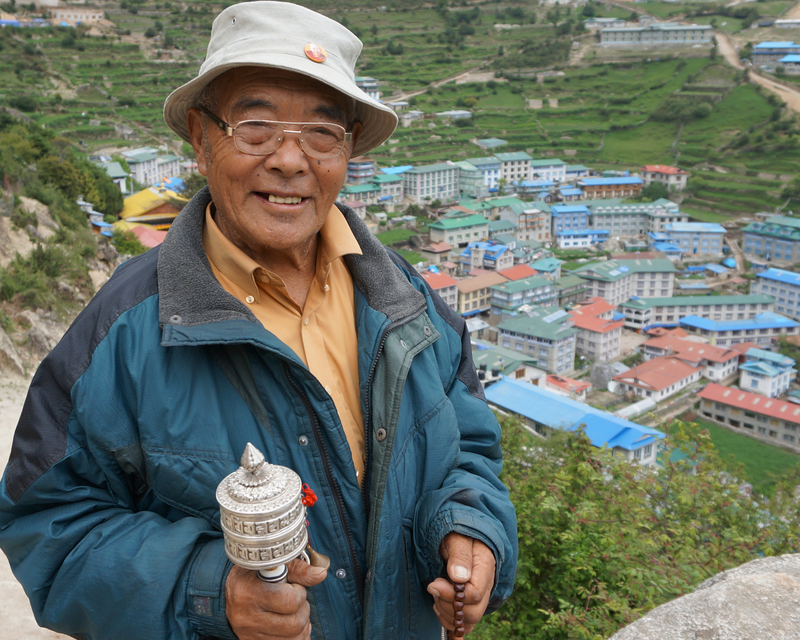 Sherpa friends introduced me to a new way of seeing the world through everyday life. 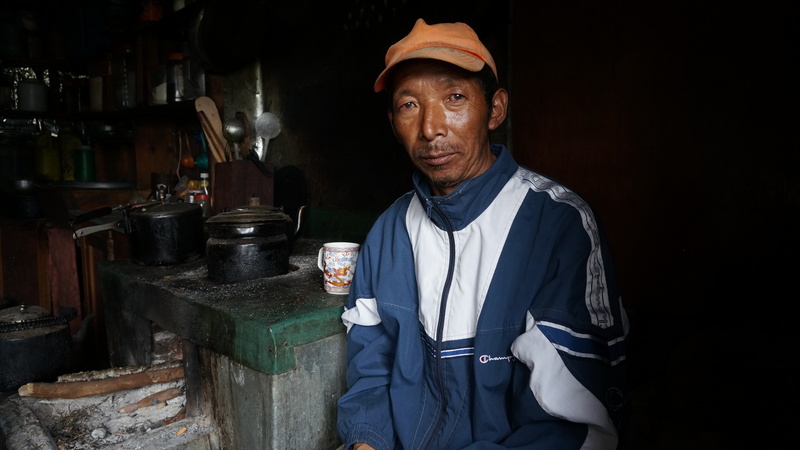 Whether monk or shepherd, they know who they are and what they believe as “Sherpa people”. I saw an acceptance of mystery and of questions we just cannot answer. Living in another culture forced me to think about how it works, to confront the ironies and inconsistencies of a different way of being. Soon, I realized that one layer of meaning reveals more queries within. The more one starts to understand, the more one realizes all there is to question and explore. Looking at other cultures as different from our own, we split the whole into parts. We analyze what we see happening and ask why. For people of the other culture, it is their way of life. We examine the oddity of different traditions and customs rather than the inner purposes that might bring us into an understanding of the culture. We end up looking at how the “other” culture is different from our culture rather than at our commonness in the wholeness of humankind. While working on the museum, I started to see and question the ironies of my own culture and gained a new way of looking at myself and at my own way of life. I was moved by what I saw and experienced. I became a believer in the value of inner culture that manifests itself in everything we do — in small actions in everyday life, in our interactions with everyone we meet, and in what we think and say. I have come to see that while outside cultures divide us, inner cultures, the core of all religions and beliefs, can bring us together. The intention of offerings is most important. 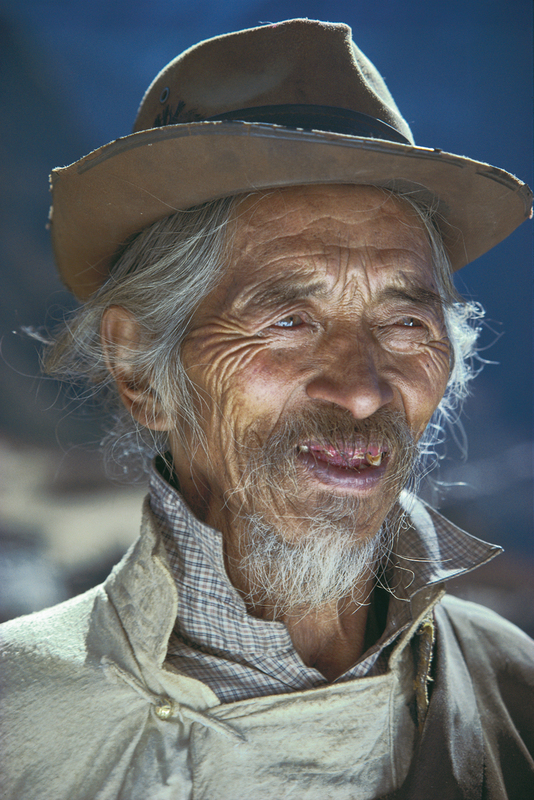 Khonjo Chombi was renowned among the Sherpas as a village leader, for his knowledge of Sherpas folk songs, and his skill as a dancer. 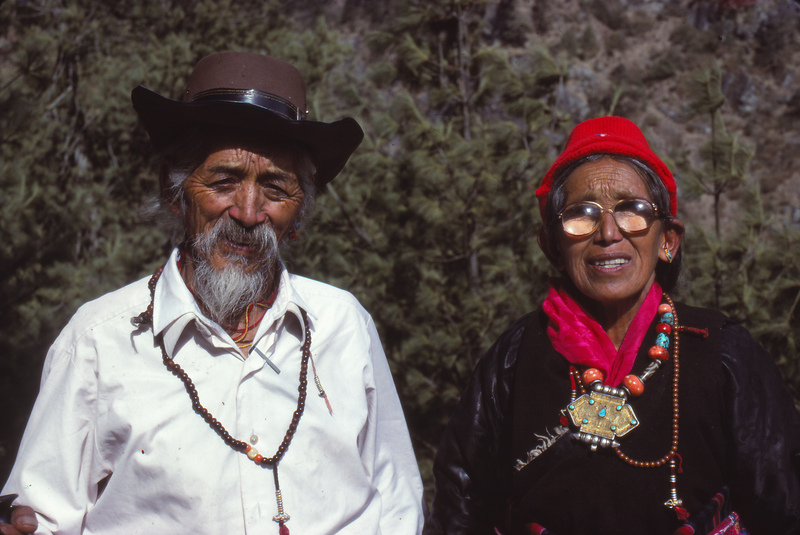 He was often asked for his knowledge of Sherpa history and culture so Tengboche Rinpoche had appointed him to be one of my ‘informants’ for the Sherpa Cultural Centre while I worked there in the 1980s. 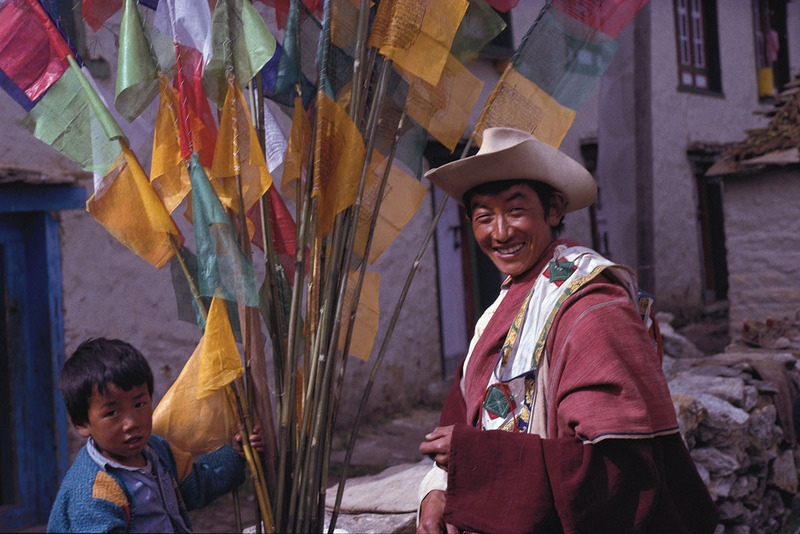 Khonjo Chombi is sitting by the window of his house in Khumjung sewing prayer flags onto bamboo sticks. Khonjo Chombi pauses as he finds more thread for his needle. “Way back, one ancestor moved from Lhasa to Kham in eastern Tibet, where he settled, practised religion, and had a family.” He then names off successive generations of ancestors for three hundred years. “In the fifth generation, there was a war between Kham and Tibet. My ancestor, Michentokpa, did not want to fight because it was against the Buddhist tenets to kill any living being. So, he left Kham and first went west to the north side of Everest, then crossed the pass into Khumbu. He may have been one of the first to cross this way into the Khumbu ‘beyul’ (the sacred hidden valley). First, he settled up high near treeline at Pangboche. This place was like Tibet. Later, his grandson moved south to the Solu valley, to a place called Thakdobuk just below a pass. Our clan name Thakdopa comes from this place. 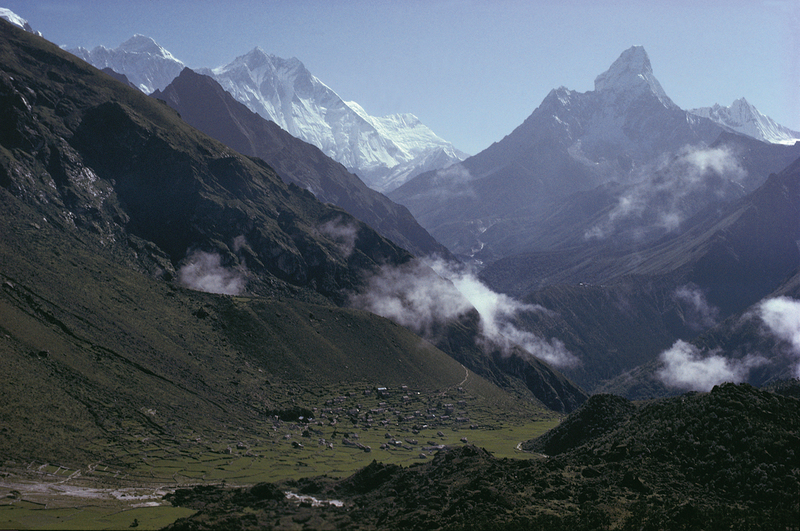 Eight generations later, my family moved to Thame in the Khumbu. After another three generations, my great grandfather moved to Khunde. He had five sons. My grandfather’s marriage was arranged so that he moved into this house as a son-in-law. My father was his only son, and I was my father’s only son. 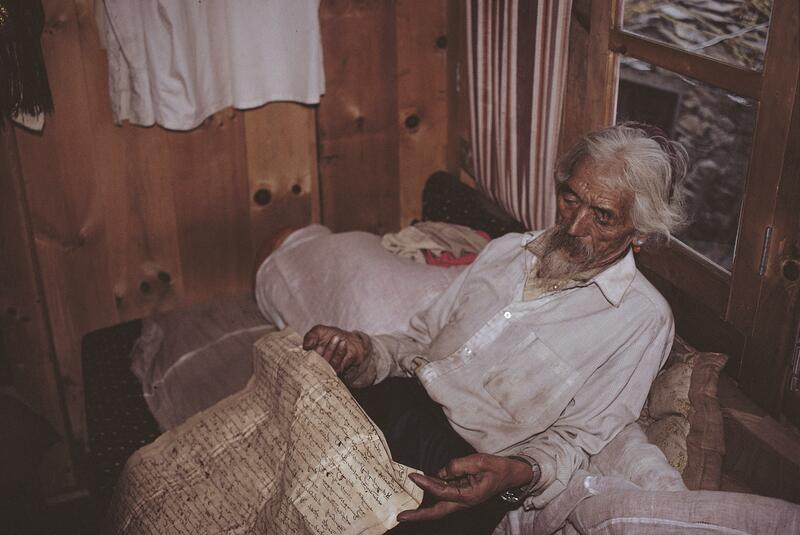 “My father traded sheep, goats, and ponies throughout eastern Nepal and to Darjeeling in India.” He pulls out a big plastic bag of folded papers, some written in Nepali script and others in Tibetan. He reads aloud from one of the documents dated the Nepali year 1885 (1828 AD). These villages in the remote Khumbu Valley have always been in the nexus of different political authorities, although the Nepali kings ruled since 1769, the Sherpas retained their distinct culture with similar traditions to the Tibetan people to the north. Prior to 1769, various ethnic kingdoms in east Nepal had had enough power over the Sherpas at times to demand taxes or tributes. Pulling out another paper, he continues, “This list of rules is from the Nepali year 1910 (1853 AD); it also records the taxes collected and how much land people owned. The government in Kathmandu was impressed that my father had dealt with thieves robbing traders in east Nepal, so they asked him to be the tax collector in Khumjung. “My father performed our Buddhist rituals and treated people with herbal medicines as an amje (traditional doctor). He was also a politician, lawyer, tailor, and carpenter. As a politician and trader, he was sued many times, even in Tibet. “I first saw them when I was trading in Darjeeling and Calcutta. I would normally go twice a year. In the fall, I’d take dzopchioks to Tibet and trade them for Tibetan horses which everyone liked because they were so strong. I’d take the horses to Sikkim or Nepal. I’d also sell Tibetan goods as I went through Solu to the Indian border. “Finally, I’d go to Calcutta with the money. What a surprise the first time I went. There were people from all over east India and the British with their trains and cars. In Calcutta, I’d buy cloth and corals to bring back to Khumbu and then Tibet. Khonjo Chombi brings out an old photo album and shows me photographs of his tour in the 1960s. Sir Edmund Hillary had led an expedition in 1964 to view and photograph a yeti, the legendary ‘snowman’ of the Himalaya. Early Western explorers had claimed to have seen huge footprints of a two-legged creature in snow on the high passes. Sherpas have legends of the yeti. 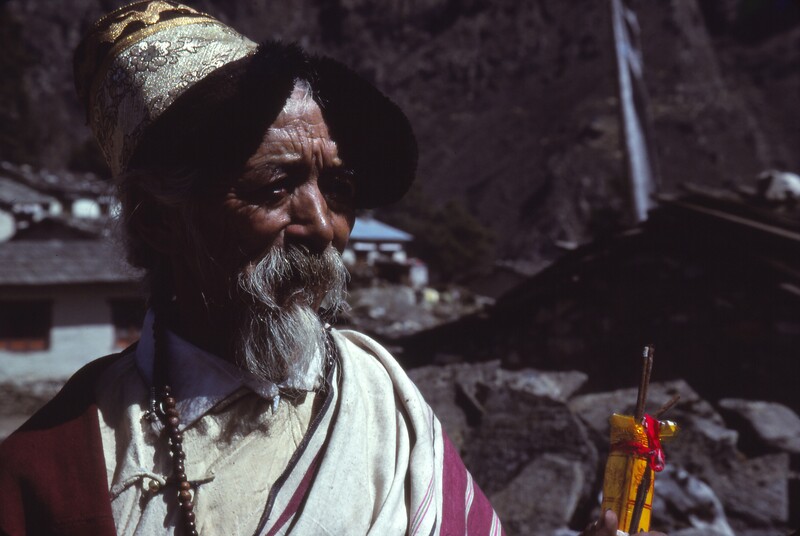 About 350 years ago, the ‘patron saint’ of Khumbu, Lama Sangwa Dorje was particularly fond of a yeti who brought him food and water while the he was in meditation retreat. 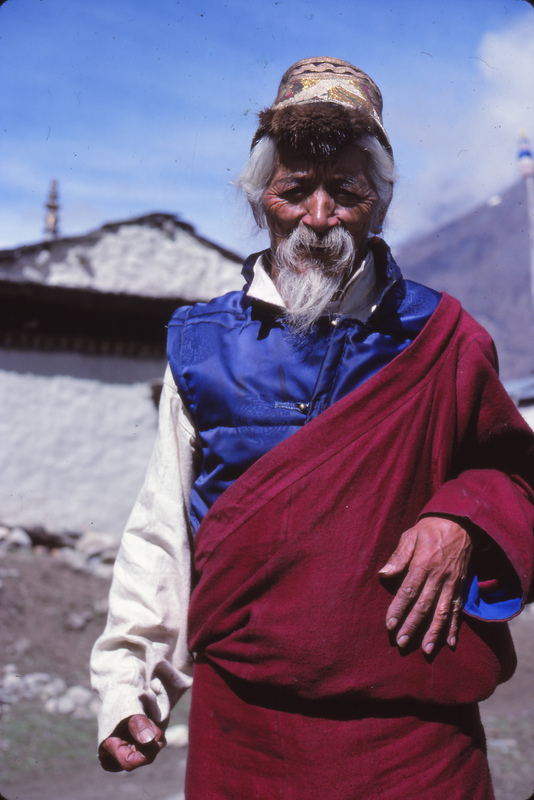 When the yeti died, the Lama put its scalp and hand bones as relics in the Pangboche village gompa. There is also a yeti scalp in Khumjung gompa. Khonjo Chombi explains, “The foreigners requested that they be allowed to take the scalp to their foreign lands to show it to their doctors. The villagers agreed if one of us could accompany the scalp on its journey around the world. They chose me to go. The foreigners brought in a flying machine that I’d never seen before. I had to get into the machine – now I know it is called a helicopter. We flew to Kathmandu, where I got into a bigger flying machine, with two other men. “First we went to England. Here is a photograph of me with the Queen,” says Khonjo Chombi as he points out the picture of himself in his traditional Sherpa garb with a young looking Queen Elizabeth. Just then, a young man enters the room. He tells Khonjo Chombi how he and his wife have lost two babies in the past four years, but they now have a new baby boy. He had asked Tengboche Rinpoche for an auspicious name for the child, and is now here asking Khonjo Chombi to recite the prayers for the child’s naming ceremony. Khonjo Chombi agrees to come perform the rituals the next day. The man invites me to the party and I accept knowing that to the Sherpas, one helps the host gain merit by receiving their hospitality at these ceremonies. Note: Khonjo Chombi passed away in the early 1990s. From Khumbu to London, celebrations the week of May 29th, commemorated the 60th anniversary of the first ascent of Everest. The celebrations often focus on the two summiteers, Hillary and Tenzing, belying the fact that the actual climb was truly a team effort. 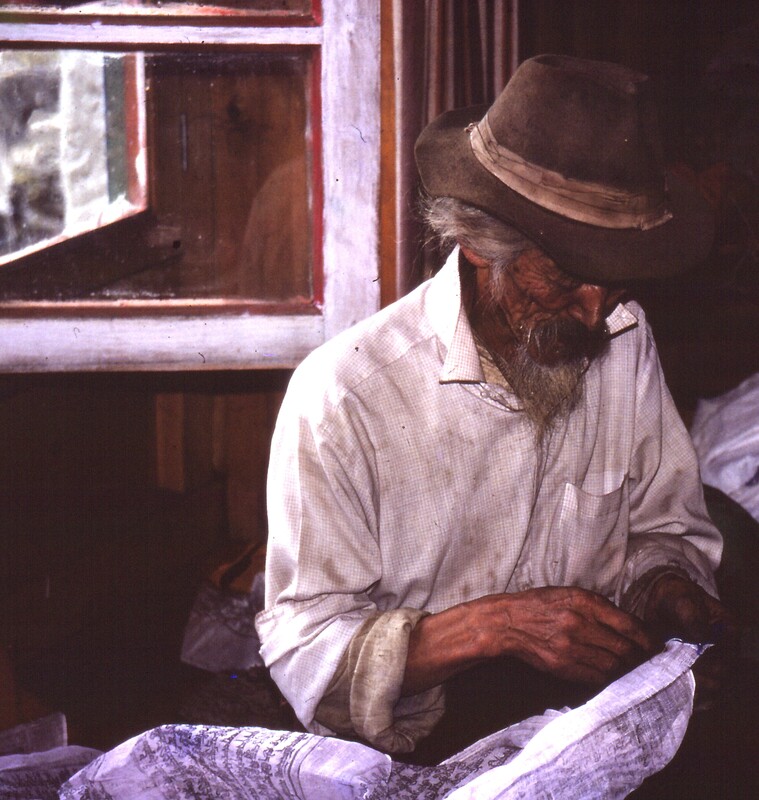 While Tenzing was the lead climbing Sherpa, an often forgotten figure is the sirdar, the foreman of the expedition. 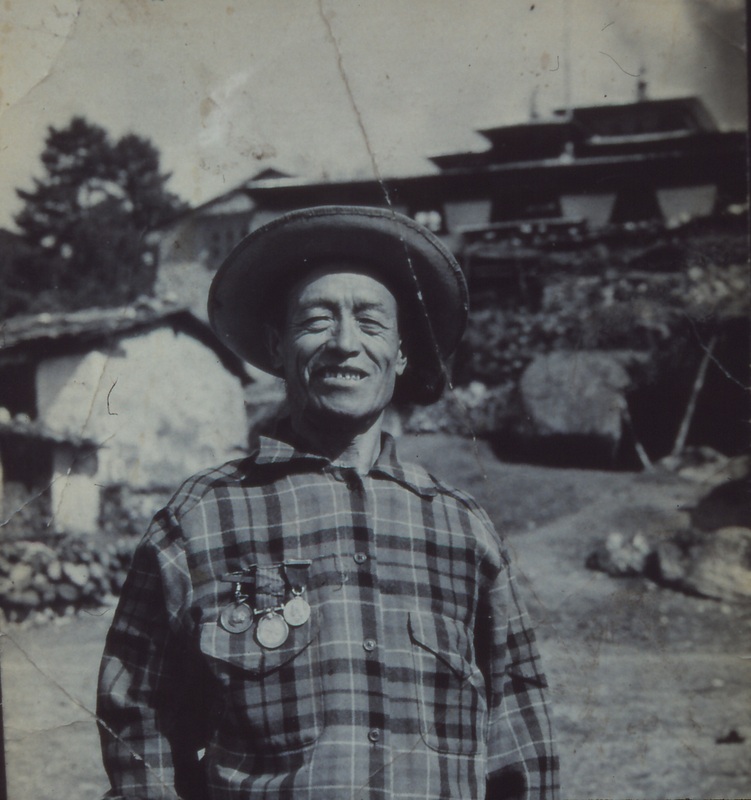 “Has my grandfather been completely forgotten?” asks Tashi Sherpa of Tengboche as we sort through a bag of old photographs. 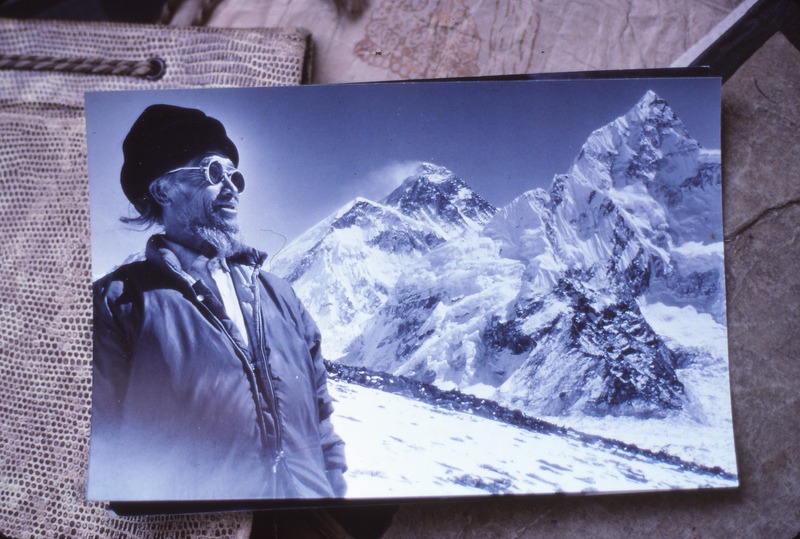 As the then renowned sirdar (foreman) of the 1953 Everest Expedition, Tashi’s grandfather, Dawa Tenzing of Khumjung managed the virtual mountain of supplies, porters, Sherpa high altitude porters, and logistics. He ensured the safe transport of over seven tonnes of supplies and equipment from Kathmandu to Khumbu. The porters he employed represented the wide spectrum of ethnic peoples of eastern Nepal as seen in old expedition photographs. At the time of the ’53 expedition, Dawa Tenzing (also known as Da Tenzing) was over 40 and was already a veteran of several Himalayan expeditions. 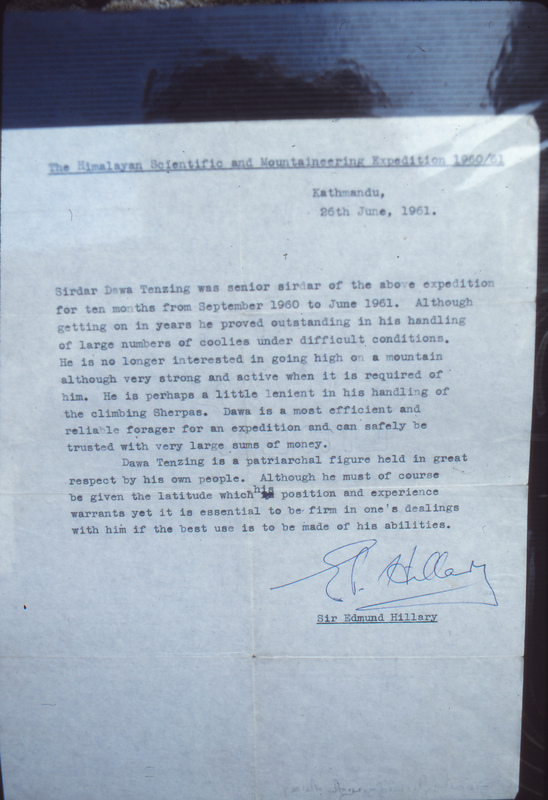 Having gone from Khumbu to Darjeeling in search of work as a young man, Dawa Tenzing had memories of the disappearance of Mallory and Irvine on Everest in 1924 according to his bio on the Royal Geographic website. 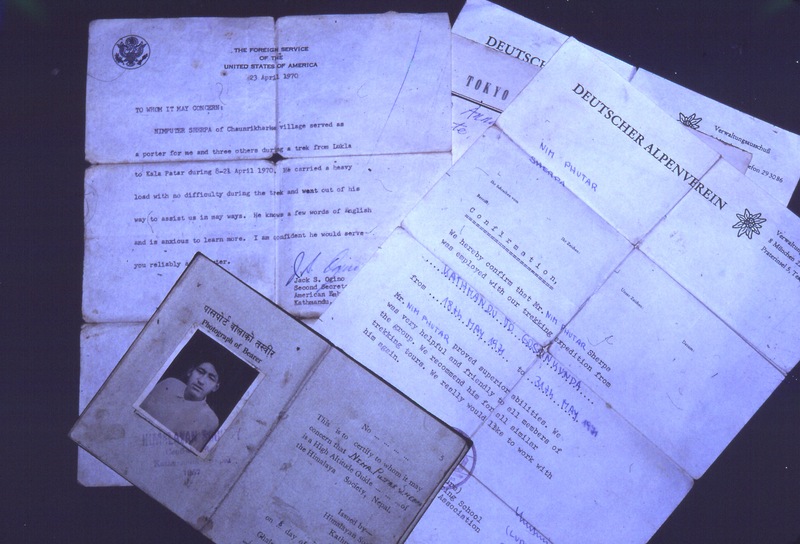 There is no existing record of his expeditions before 1952, but from 1952–63 records show that Da Tenzing was on several expeditions — reaching the South Col twice in both 1952 and 1953. He was sirdar of the 1955 Kangchenjunga expedition, and again went twice to the South Col with the American expedition of 1963. 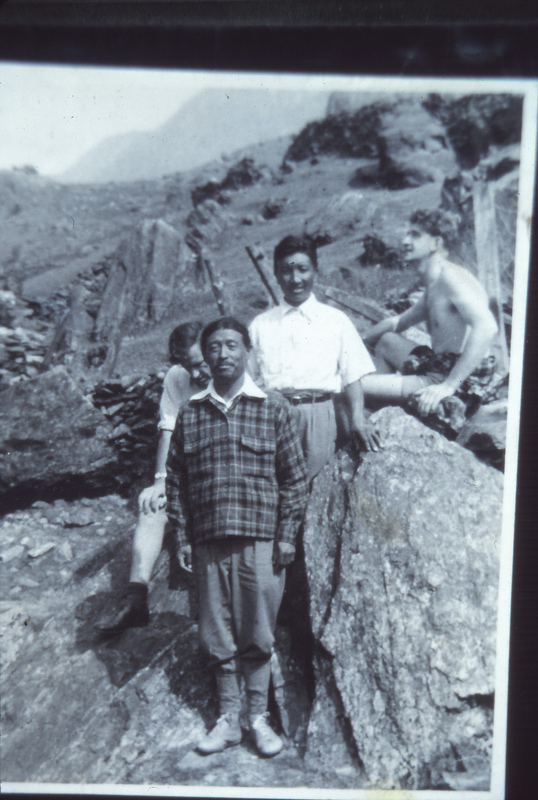 In the afterglow of the 1953 expedition, the British Alpine Club had made Da Tenzin an honorary lifetime member. His remote address had not escaped their mailing list and months later all alpine club mail had duly arrived at Tengboche. In among the brochures advertising anything from crampons to electric kettles were letters and photographs from the previous generation of climbers from around the world. 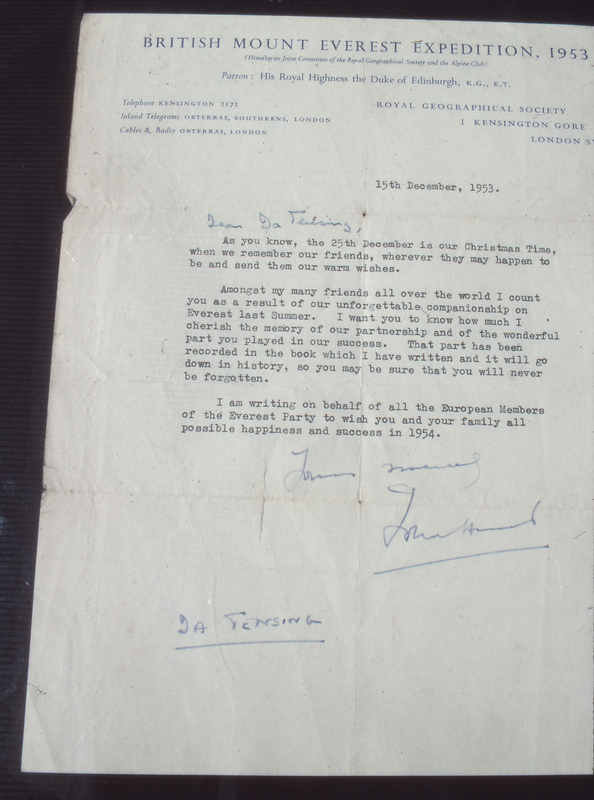 These included Lord Hunt, with whom he had managed the ’53 expedition, and others from George Lowe to Reinhold Messner. 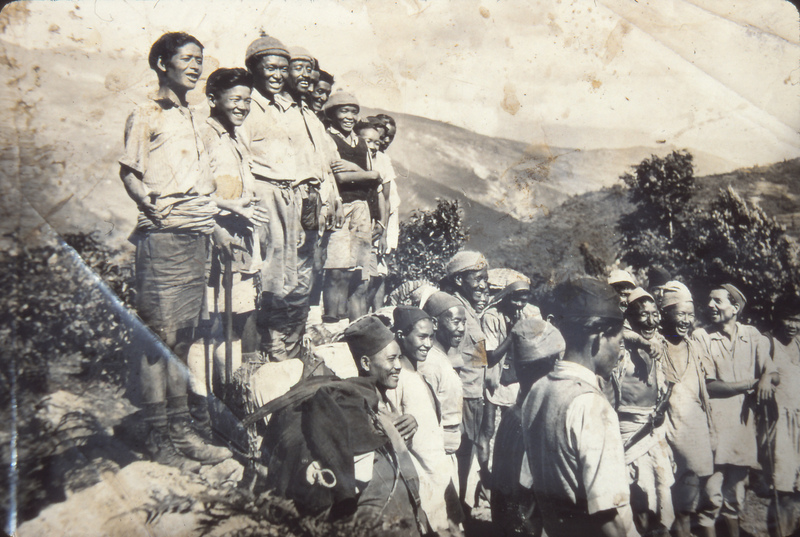 The photographs revealed Da Tenzing’s close relationship with dozens of expedition climbers from the 1950s onwards. Some showed his attendance at celebratory functions in Britain clad in traditional Sherpa dress and still sporting a long braid wrapped around his head as he met the Queen. In these 60th celebrations, let’s remember the mountain of men (and some women porters) who made it possible to reach the summit.